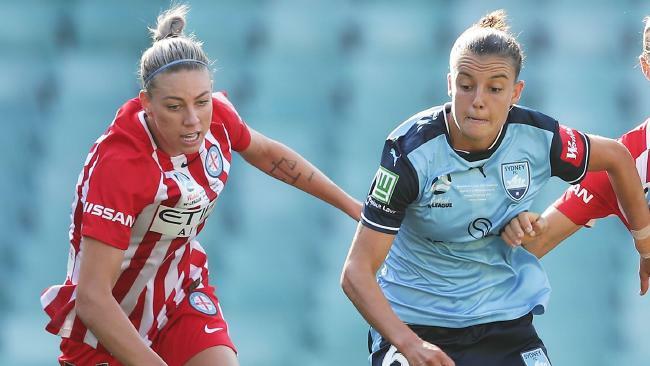 KYAH Simon has been ruled out of the Algarve Cup with a hamstring injury sustained in the W-League grand final. 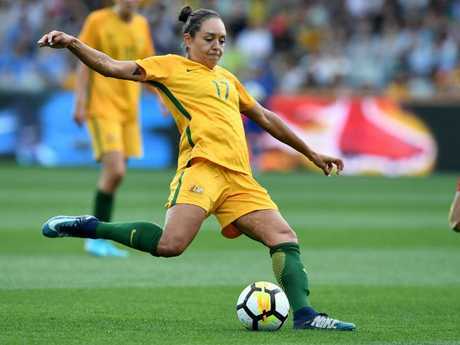 In a further blow to the Matildas' attacking power, scan results on Monday determined Simon will join fellow forward Caitlin Foord on the sidelines for the tournament and will not travel to Portugal with the squad on Tuesday. The 26-year-old, a part of Melbourne City's championship-winning team, is expected to recover in time for April's crucial Asian Cup in Jordan, which doubles as the World Cup qualifiers. "We would love to have Kyah and Caitlin with us in Portugal however it is in their best interests to remain in Australia and continue their respective recoveries," coach Alen Stajcic said. "We'll have four games over just eight days in Portugal, so the tournament will provide a chance for all the players involved in the squad to impress as we move towards the AFC Women's Asian Cup. Kyah Simon (centre) of Melbourne City. "Hopefully our performances in Portugal will continue to drive momentum leading into our next match on Australian soil in Perth, as well as the [AFC Women's] Asian Cup." Australia will face Norway, China PR, and hosts Portugal, as well as one yet to be confirmed country, at the 2018 Algarve Cup before returning home to ramp up Asian Cup preparations for the tournament in Jordan. While Foord will be missing from both the Algarve Cup and Asian Cup, it's understood Simon is not in danger of missing the continental championship. City teammate Steph Catley said Simon's absence in Portugal would be felt. "It would be a big blow," she said. "She had scans today. I'm not sure of the results just yet but she's in with the national team so she's being looked after. Kyah Simon lines up a shot on goal. "She's been working her way back to form, to how she used to be before she got injured and she's been amazing for us this year. 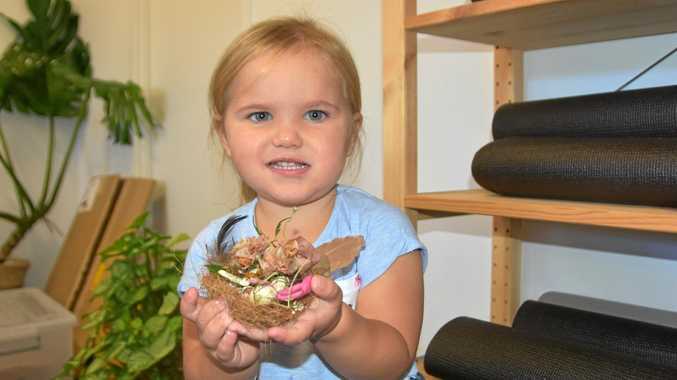 "She sets up so much around the ground. She's been sharp and enjoying her football. "It'd be a big shame for her but ... missing the Algarve in comparison to missing the Asian Cup, that would be (worse)." Simon said on Sunday that the injury, which forced her substitution after an hour, soured her grand final success. "It's disappointing and bittersweet. We got the job done and I'm happy we won the championship," she said. "If I had it my way I'd obviously still be on the plane to go but it's out of my control. "It just depends on how bad it is - if it's over two or three weeks that rules me out."